Anyone interested in gunsmithing will soon discover that the literature on the subject is quite voluminous. Five of the best gunsmithing books on the market are looked at below to help you wade through this “vast library of options.” So look no further, we'll answer the common question of: "What is the best gunsmithing book?" This is a facsimile reprint of an old 1946 classic, republished by www.bnpublishing.com in 2013. It is fairly voluminous at 528 pages and makes an excellent reference tool. The text is illustrated by over 100 sketches and pictures. You will be shown how to make and use basic gunsmithing tools, some of which, however, are now outdated. The coverage of topics is comprehensive but generally introductory. The information is, nevertheless, still useful at points to advanced students. While the tools and technologies mentioned have often changed, there is still an abundance of timeless and useful information here. 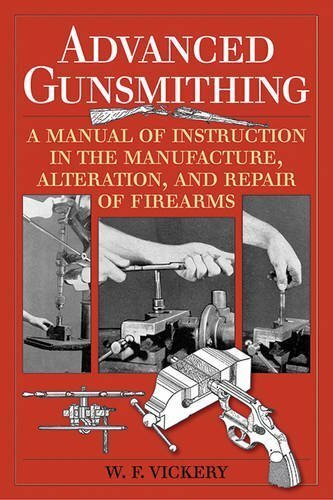 This book is a classic in the gunsmithing world, and the edition presented here is a 2015, Skyhorse Publishing reprint of the original 1940 version. Many consider this volume to be a collector’s item as well as a practical learning tool. The book is a substantial read at 448 pages and will likely be used as a reference tool by most. While hailing from the same age as Howe’s Professional Gunsmithing, this book, as the name implies, is somewhat more advanced. You will find in-depth treatments of various gunsmithing tools, proper gunsmithing methods, and gun components. The book is heavy on the mechanics involved in building and fixing firearms. It is not an easy read, but its detailed text is well illustrated to ease the learning process as much as possible. Some of the methods presented are outdated, but many have remained the same. The fact that Vickery covers his subject comprehensively and in detail makes it always a valuable resource. Additionally, he mentions methods not requiring expensive or rare tools, which is still helpful despite some changes in what constitute common gunsmithing tools. This small book of 160 pages was published in 2001 by Paladin Press. It is a DIY book that comes in handy for emergency repairs. While the contents are not necessarily “mainstream” as far as gunsmithing literature is concerned, they are certainly unique and entertaining. In some situations, the suggestions found here will be quite practical. In others, it might be safer to avoid them unless a true emergency actually arises. The book features methods the author learned by fixing up “junk guns” all over the world in remote and rough environments. The best ways to fix a weapon with ordinary junk found lying around in a war zone, or in your garage, are explained in detail. Removing rounds or ammo stuck in your barrel, creating make-shift ammunition, taking the dents out of your magazine, and straightening out a bent gun barrel are among the topics covered. If you need to repair relatively small weapons using improvised methods, this book is for you. Patrick Sweeney has written a multitude of gunsmithing articles in periodicals such as Handguns Magazine. He has also authored a number of valuable volumes, many of them published, like this one, by Gun Digest Books. This is the 4th edition of a book first published in the early 2000s, and this latest version just came out in 2015. It has been expanded with whole new chapters and updated throughout its 384 pages. The 4th edition is significantly superior to the 3rd. Repair and maintenance methods on a number of common revolvers and pistols are covered. There are over 800 pictures to illustrate these processes. A word of caution, however, is due. This book does not normally stop to explain the basics, and even the pictures seem to have the advanced student in mind. Thus, while the book claims to be for both novice and experienced gunsmither, it is much easier to follow if you have already mastered the basics. This is not necessarily a bad thing, however, since advanced students will tire of hearing the basics, which now seem obvious to them, constantly repeated. This book was published in 2001 by Paladin Press. It is small at only 160 pages, but the price is correspondingly small. The information given here on producing and repairing various rifles is well illustrated. It is also laid out in a step-by-step manner that is very helpful to beginners. Every major type of rifle is covered, if in short space. You will learn how to improve a rifle’s accuracy, how to keep it “shoot-ready,” and how to modify it in various ways. You will also be told of common mistakes to avoid and of which repairs require the intervention of an expert.